Suicide bombers killed 50 police recruits in central Iraq and 49 Shiite pilgrims in the south Thursday, a stepped-up attack as politicians worked to form a coalition government. Five U.S. soldiers were killed by a roadside bomb. The two-day death toll from insurgent attacks rose to 163, a surge of violence not seen since before the Dec. 15 parliamentary elections. Attackers killed 53 people on Wednesday. A statement from the U.S. military said only that the soldiers were patrolling in the Baghdad area, while Iraqi police Capt. Rahim Slaho said a U.S. convoy headed for the Shiite holy city of Karbala had been attacked 15 miles south of the city and that five soldiers were killed. No names were released. The suicide blast Thursday near the Imam Hussein shrine in central Karbala, 50 miles south of Baghdad, killed 49 people and injured 52, Karbala police Col. Razaq al-Taie. In the attack's aftermath, a woman and an infant girl in a bright red jumpsuit lay in a pool of blood, their faces covered by a sheet. Television images showed men ferrying the wounded in pushcarts. The bomber appeared to have set off the explosion only about 30 yards from the shrine in a busy pedestrian area surrounded by shops. In Ramadi, a U.S. spokesman said about 30 people were killed when a suicide bomber attacked a line of about 1,000 police recruits. Iraqi police said about 40 people were injured. The attack took place at a police screening center in Ramadi, an insurgent stronghold 70 miles west of Baghdad. Marine Capt. Jeffrey S. Pool said recruits later got back in line to continue the screening process. Final results from the elections were expected to be released within two weeks, and were expected to show the United Iraqi Alliance with about 130 of parliament's 275 seats. That figure is well short of the 184 needed to form a government. In other violence Thursday, a suicide car bomb killed three Iraqi soldiers in Baghdad, Lt. Col. Thamir al-Gharawi said, and gunmen killed three people in separate incidents, police said. The year 2005 saw 2,880 terrorist attacks target Iraqi security forces and civilians, the Interior Ministry said Wednesday. 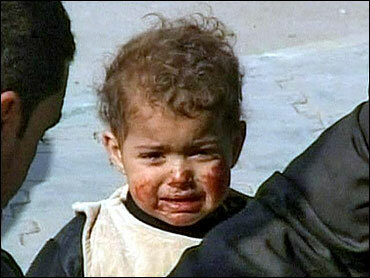 Some 1,225 policemen and 475 soldiers were killed, along with 4,021 civilians and 1,709 insurgents, it said. Overall, 7,430 Iraqis were killed, according to the figures. It was impossible to confirm the accuracy of the numbers because many slayings in Iraq go unreported and there are no other official figures with which to compare them. The United States military does not track civilian deaths. The Karbala bomber detonated a vest with about 17.5 pounds of explosives and several hand grenades, al-Taie said. Small steel balls that had been packed into the suicide vest were found at the site, as was one unexploded grenade, he said. Many pilgrims travel to Karbala on Thursdays to be at the holy site for Friday prayers. One pilgrim, Mohammed Saheb, said he travels to Karbala every Thursday. "I never thought that such a crime could happen near this holy site," said Saheb, who sustained a head injury. "The terrorists spare no place from their ugly deeds. This is a criminal act against faithful pilgrims. The terrorists are targeting the Shiites." Speaking from a hospital bed where he was being treated for burns and bruises, Akram Saleh, a vendor, said he lost consciousness after the explosion. "I was selling toys near the shrine when I flew into the air because of the explosion," he said. Al-Khazraji blamed "takfiris and Saddamists" for the Karbala attack. The takfiri ideology is followed by extremist Sunni Muslims bent on killing anyone considered to be an infidel, even fellow Muslims who disagree with their doctrine. Al Qaeda in Iraq leader Abu Musab al-Zarqawi is a takfiri. His group has often targeted Shiites. A senior official in the Iraqi Accordance Movement, the main minority Sunni coalition, denounced the violence and called for solidarity among Iraqis to defeat it, but blamed the government for allowing it to happen. "This government has not only failed to end violence, but it has become an accomplice in the cycle of violence by adopting sectarian policies and by weakening the state and strengthening militia groups," Izzat al-Shahbandar said. A statement by the Supreme Council for the Islamic Revolution in Iraq, or SCIRI, a partner in the governing Shiite coalition, said the attacks are part of a plot "to eliminate the Shiites in Iraq." "These crimes took place after statements and threats of a civil war issued by some Iraq political groups," it said. "Such political groups bear the responsibility for every blood drop that was shed." Karbala has been relatively free of violence since December 2004, when seven people were killed and 31 wounded in an attack. But the deadliest civilian attack in Iraq since the war began came in March 2004 in Karbala, when coordinated blasts from suicide bombers, mortars and planted explosives exploded near Muslim shrines, killing at least 181 people. On Wednesday, a suicide bomber struck a funeral for a Shiite politician's nephew, killing at least 32 mourners, wounding dozens and splattering tombstones with blood. Altogether, 53 people died in the attacks Wednesday, which included two car bombings in Baghdad and a militant ambush on a convoy of 60 oil tanker trucks heading from Iraq's biggest refinery to the capital. The funeral bombing in Muqdadiyah, 60 miles north of Baghdad, bore hallmarks of Islamic extremist groups such as al Qaeda in Iraq. Politicians said the attack was an attempt to hinder a broad-based government, or force the dominant Shiite alliance into further compromises. Shiites were said to be close to a deal on a coalition with Sunni Arabs and Kurds nearly three weeks after parliamentary elections. U.N. Secretary-General Kofi Annan noted that the "horrendous crime" was the latest in a series of increasingly violent attacks after the Dec. 15 elections, and called on Iraqis not to undermine the democratic process.